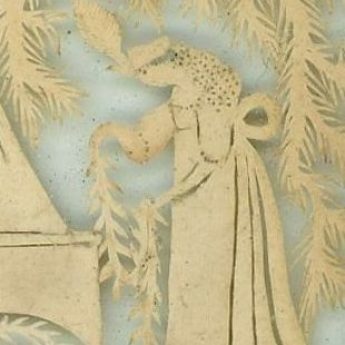 The art of paper-cutting was fashionable at the Court of George III whose daughter Princess Elizabeth was an ardent cutter. 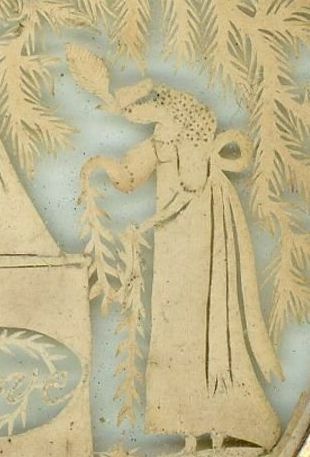 Tiny sharp scissors and pointed quill knives were used to cut the paper with great delicacy. Pins were then used to prick the paper in order to create texture. 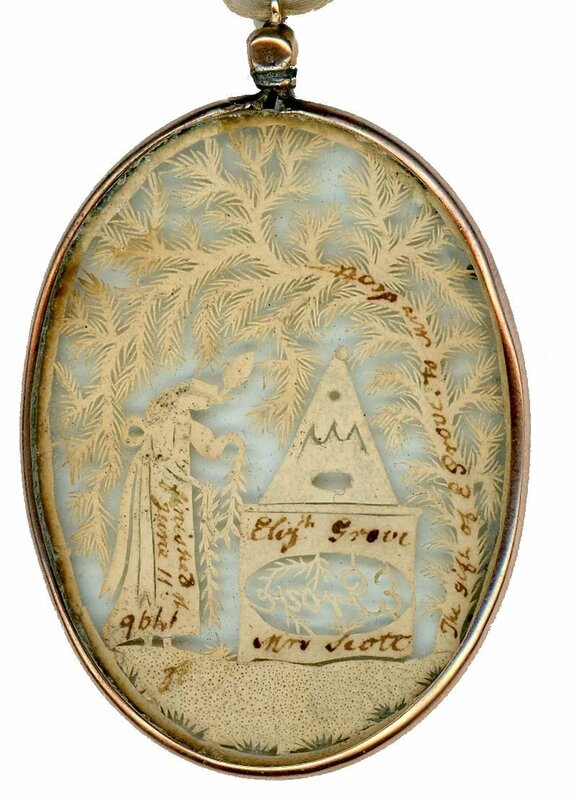 This superb Georgian example of the craft shows a young lady, head bowed in grief, laying a garland on a tombstone situated beneath a weeping willow, a tree that is symbolic of grief, sorrow and mourning. The detailing is wonderful from the leaves on the tree to the feather in her hat and even a touch of grey watercolour for her hair. The name ‘E. 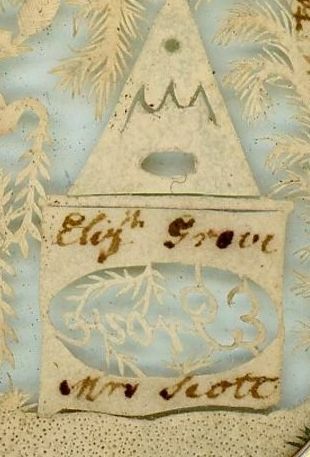 Grove’ is cut out on the tomb. 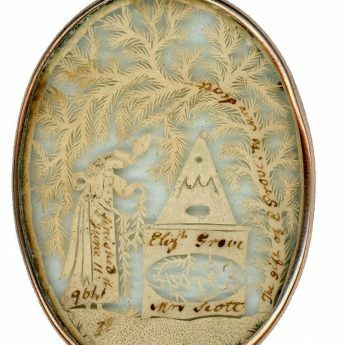 The reverse side of the miniature has been carefully inscribed in ink on the base of the tomb ‘Elizh Grove / Mrs Scott’ with a further inscription partly on the tree ‘The gift of E. Grove to Mrs Scott’ and partly on the figure ”finished June 11th 1796′. 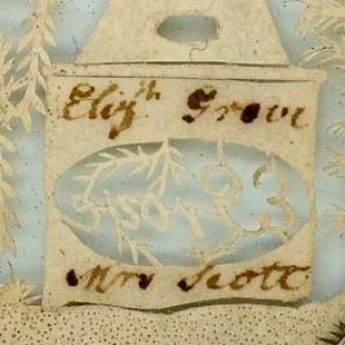 The miniature is in remarkably fine condition with just a little age browning on both sides and the bending of a few of the leaves. It is housed in the original narrow gold frame that is glazed on both sides, one side with bevelled glass, the other plain. There is an under chip to the glass on one side just under the bezel. 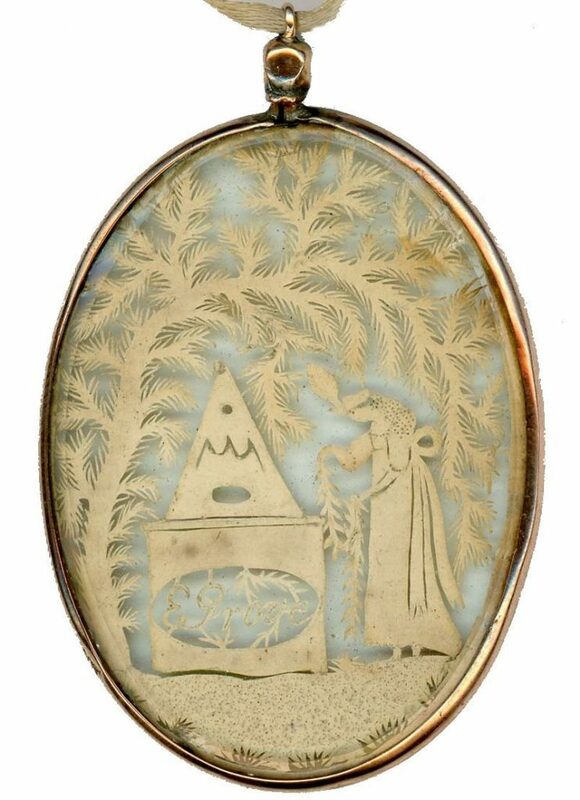 Mourning miniatures became popular expressions of private grief during the late eighteenth century and often depicted a female mourner draped over a classical urn beneath a weeping willow. They are more usually painted on ivory and set in small pieces of jewellery or on the reverse side of a portrait miniature.